Legal Developments In Non-Competition Agreements: Hurricane Lane's Lawsuit and the Relevance of Being "Malicious"
Hurricane Lane's Lawsuit and the Relevance of Being "Malicious"
Football is huge in Tennessee. When Lane Kiffin bolted UT for Southern California after a rather pedestrian 7-6 season in 2009, Volunteers fans were irate. Not because of Kiffin's remarkable pedigree - at best, he has an unimpressive record of mediocrity - but rather because he jumped ship from one blue-chip program to another. So you would think Kiffin might be careful when wading into Tennessee. Not so. Last week, the Tennessee Titans (really Tennessee Football, Inc.) filed suit against Kiffin claiming that he wrongfully induced their running backs coach, Kennedy Pola, to quit and assume a position with the USC football program. Pola had a one-year contract with the Titans, and it contains an exclusivity or in-term non-compete clause. Simply put, Pola could not accept employment anywhere else during the term of his employment contract. A copy of the Complaint can be found here. 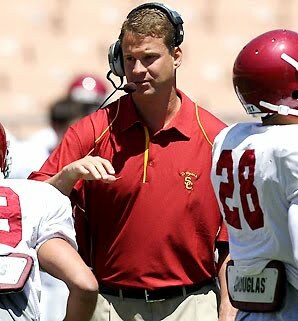 Much has been made in the news media of Kiffin's alleged "malicious" conduct. The only real relevance is that under Tennessee law, the Complaint must allege malice in order for a plaintiff - like the Titans - to recover treble (or, triple) compensatory damages. Tennessee law is somewhat unique in this regard. While contractual interference is a well-recognized tort, the availability of treble damages is a statutory remedy in Tennessee that is not particularly common. All that said, it is clear that the lawsuit is trying to capitalize on Kiffin's infamy in the Volunteer State. It makes allegations about Kiffin's abrupt departure from UT and recruitment of other UT assistants (including his father) to join him at USC. It would be surprising if USC and Kiffin allowed the case to progress very far, particularly given that he is set to embark on his first season at USC in just a month or so. Interestingly, the Titans did not sue Pola, the coach who left to join Kiffin. It is possible the Titans did not want to send a message to other potential coaches around the league that they are willing to sue ex-employees and who might be deterred from joining the Titans in the future. Had the Titans elected to sue Pola and prevent him from assuming his position with USC, it almost certainly could have done so. There are many cases involving athletes where injunctive relief has been granted to prevent a player from terminating his services while the contract is in force and jumping ship to a rival. The most famous of these cases involved Rick Barry, who tried to get out of his NBA contract with the then-San Francisco Warriors in favor of playing in the now-defunct ABA with the Oakland Oaks. Barry, the first player to switch from the NBA to the ABA (in the same geographic market, no less), was ordered to sit out a year before joining the Oaks.